Meet Birdsong Farm's first Jersey cow family! Birdsong Farm's "Blossom" family was started with my very first cow, Birdsong Summer Blossom, in the summer of 2003. Blossom was a Jersey/Black Dexter/Red Angus cross, and I recorded her as 0% pure Jersey. Thanks to Jersey Canada's Grade-Up Program, after five generations I can register the calves as 100% pure Jersey. Blossom's offspring are given flower names. Present cows in the Blossom family are Birdsong Shirley Rose VG 88, Birdsong Golden Buttercup VG 85, Birdsong Sweet Jasmine, and the newest member, Birdsong Remembrance Poppy. Past cows are Birdsong Summer Blossom -P (sold in 2012), Birdsong Blossom's Daisy VG 87 (sold in 2014), and Birdsong Autumn Aster GP 83 (sold in 2015), and Birdsong Sunshine Marigold (died in 2018). BIRDSONG SHIRLEY ROSE was born on Birdsong Farm on September 24, 2012. I named her Shirley Rose to fit the flower theme I've chosen for the Blossom family, and after my aunt, Delores Shirley Rose. ​Shirley Rose's sire is BRIDON REMAKE COMERICA and her dam is BIRDSONG BLOSSOM'S DAISY. Shirley Rose is registered as 75% pure with Jersey Canada; please click on the Jersey Canada logo below to view her pedigree. If bred with a purebred Jersey bull, Shirley Rose's offspring can be registered as 87.5% pure with Jersey Canada. Shirley Rose is tested as type A1/A2 for Beta Casein and type A/B for Kappa Casein. She is genotyped with the 80K SNP panel, and she has a GPA LPI of 757 and a DGV of 713 (Aug*17; 54% reliability); please click here to read her genotyping report. Her results for JH1 (Jersey Haplotype 1) are 99%, or tested positive, and she is negative for JH2 (Jersey Haplotype 2). Shirley Rose was classified twice as a first-calf heifer, and her initial score was Good Plus 81 (2-4) before being raised to Good Plus 83 (2-11). In 2017 she was presented again and her score raised to Very Good 88 (4-8; 3rd). Please click here to view her classification scorecard. Shirley Rose was 8th place Senior Calf at the Interior Provincial Exhibition in Armstrong in 2013, and 2nd place Senior Yearling in 2014. Shirley Rose was bred with RIVER VALLEY CECE CHROME on December 31, 2018 for an October 5, 2019 due date. BIRDSONG GOLDEN BUTTERCUP was born on Birdsong Farm on July 13, 2014. Buttercup's sire is GUIMO JOEL, and her dam is BIRDSONG AUTUMN ASTER. Buttercup is registered as 75% pure with Jersey Canada; please click on the Jersey Canada logo below to view her pedigree. If bred with a purebred Jersey bull, Buttercup's offspring can be registered as 87.5% pure with Jersey Canada. Buttercup is tested as type A1/A2 for Beta Casein, and type B/B for Kappa Casein. 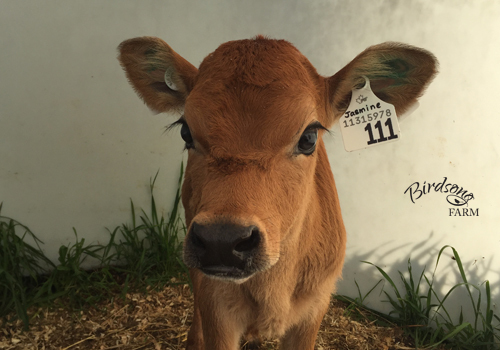 Buttercup is genotyped with the 150K SNP panel, and she has a GPA LPI of 1144 with a DGV of 1088 (Aug*17; 47% reliability); please click here to read her genotyping report. She is negative for both JH1 (Jersey Haplotype 1) and JH2 (Jersey Haplotype 2). 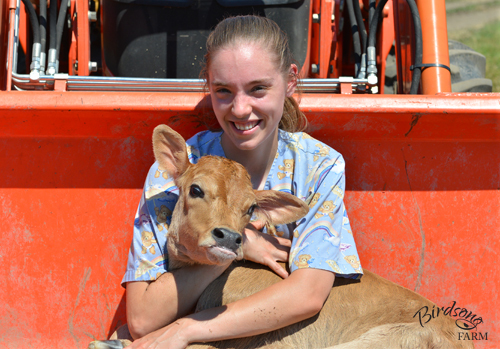 Buttercup's was on official milk test starting with her second lactation. Buttercup was classified as Good Plus 83 (2-6) in February 2017; please click here to view her classification scorecard. Buttercup placed 4th in the Summer Yearling class at the Interior Provincial Exhibition in Armstrong in 2015, and 3rd in the 2-Year-Old class at the North Okanagan Spring Show in Armstrong in 2016. Buttercup was bred with HEARTLAND MERCHANT TOPEKA on February 8, 2019 for a ​November 13, 2019 due date. BIRDSONG SWEET JASMINE was born at the Terroir Cheese dairy farm on April 2, 2016. Jasmine's sire is HOMETOWN IRRESISTABLE, and her dam is BIRDSONG SHIRLEY ROSE. Jasmine is registered as 87.5% pure with Jersey Canada; please click on the Jersey Canada logo below to view her pedigree. If bred with a purebred Jersey bull, Jasmine's female offspring can be registered as 93.7% pure with Jersey Canada. Jasmine is tested as A2/A2 for Beta Casein, B/B for Kappa Casein, and B/B for Beta Lactoglobulin. She is genotyped with the 28K SNP panel, and she has a GPA LPI of 1285 with a DGV of 1385 (Sep*17; 46% reliability); please click here to read her genotyping report. Jasmine is negative for JH1 and JH2 (Jersey Haplotype 1 & 2), and her inbreeding percentage is 6.33%. Jasmine placed 4th in the Junior Calf class at the Interior Provincial Exhibition in Armstrong in 2016. Jasmine's first calf, Quel'Thalas, was born on June 8, 2018. Jasmine was bred with HEARTLAND MERCHANT TOPEKA on August 15, 2018 for a May 20, 2019 due date. BIRDSONG SUNSHINE MARIGOLD was born at Bomi Farms on March 27, 2017. Marigold's sire is RIVER VALLEY SPICE SHOWDOWN and her dam is BIRDSONG SHIRLEY ROSE. Jasmine is registered as 87.5% pure with Jersey Canada; please click on the Jersey Canada logo below to view her pedigree. Marigold is tested as A2/B for Beta Casein, B/B for Kappa Casein, and A/A for Beta Lactoglobulin. Her inbreeding percentage is 4.85%. Sadly, Marigold passed away on March 17, 2018. BIRDSONG REMEMBRANCE POPPY was born at Bomi Farms on November 11, 2018. Poppy's dam is BIRDSONG GOLDEN BUTTERCUP VG 85, and her sire is ARETHUSA VIRTUOSO. Poppy is registered as 87.5% pure with Jersey Canada; please click on the Jersey Canada logo below to view her pedigree.